The difference between compliance and commitment is relationship. Compliance is forced. Commitment is given. #1. Care. If you don’t care about people, get out of leadership now. Leaders navigate tensions between getting results and building relationships. Really, there is no tension. Achieve results through relationships. Invite people to commit. Don’t pressure them. #2. Commit to people. Successful leaders are goal driven. The downside of being goal driven is walking over people in the pursuit of goals. Adopt people goals as well as result goals. #3. Bring benefit. Help people reach their goals. 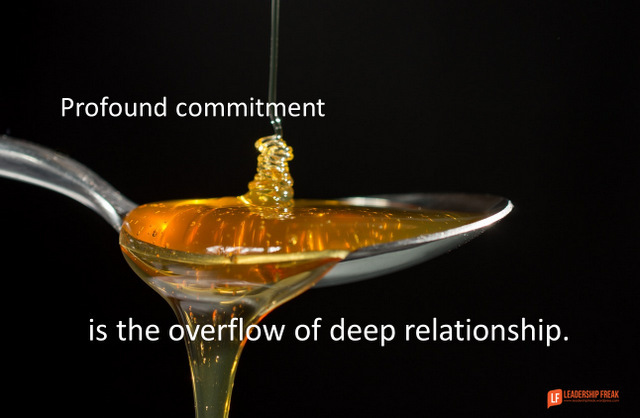 Build deep commitments by aligning personal and organizational goals. Full alignment results in profound commitment. Talk about their dreams, even when those dreams go beyond your organization. Make training the means to reaching their goals, as well as the organization’s. Care about their challenges and losses, even as you expect top performance. We don’t commit to scroogie leaders, we comply. Generosity of spirit invites commitment. Remarkable leaders are generous in spirit and tenacious in will. Tenacity and generosity protect each other. Tenacity without generosity makes you a bulldozer. Generosity without tenacity makes you a pushover. Open hearted tenacity makes you remarkable. How might you open your heart today? How might you bring benefit to your teammates today? One of the best word , keep listening from people. At many occasion it’s true they simply utter this word but never own up. Now discussion is wide open like what is most important is Commitment or ownership or commitment for ownership. Or ownership owned by committed people or commitment owned by committed people. How can you defined or interpret. It’s question of what has been well occupied in your DNA. Very boldly I am saying to all guys create ownership in your employees with a proper understanding on value of organisation and with their own values with a firm faith belive me commitment will multiply manifold with a professional commitment and change in behaviour starts reflecting , first sign of commitment with a ownership of committed people. When values and system are clear with a commitment followed by ownership then decision making is very simple. Automatically change takes place commitment replaced by ownership, I hope this is truly a right commitment. I love this quote. Seems the bulldozers are the hardest to understand perhaps because being in public safety people always come first but when I encounter leaders who don’t put people first I am left wondering how they became leaders in the first place. Great topic Dan! Commitment is the key to any initiative. This applies to everyone involved and in both directions up and down in an organization. People know when you are merely providing lip service or trying to sell them snake oil for the sake of appearances. However, if you show commitment and foster expectation, people will see the works of your words and follow suit. The ole “do as I say and not as I do” routine does not work. Leaders need to walk the walk and be committed to their initiatives for them to be successful. A Passion for Excellence, with loyalty and commitment to people and the task, is in my belief the best route to achieving and maintaining both sanity and success …..
By the time you read this, it should be 2016 — so I hope you had a great Christmas and New Year holiday season. My apologies for depositing another email in your in-box, but this one was too good to pass up. It offers some powerful and compelling leadership lessons for gaining employee commitment and engagement. I love this. It’s Wonderful. Isn’t it really all about self awareness, people and situational awareness and emotional intelligence and availability? A former Machiavellian leader of mine told me that my strength of being tenacious was a negative trait. Sometimes the best leaders are born in the most vile, toxic work environments. Despite the negative waves of encouragement from my leader, I still struggled to provide a positive work environment in a toxic work environment. If you can still stick to your public mantra and not capitulate under inner or outside toxic forces, then you are a leader of distinction. This is a very intentional practice and very effective… To be relational. I have found that team members get “business” when they are frustrated with leader but to respond relationally can help diffuse. Though, sometimes it feels …unfair.